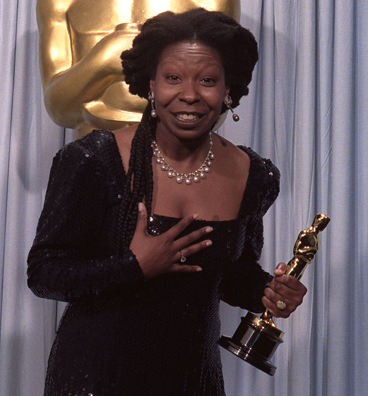 COMEDIAN Whoopi Goldberg admitted to smoking weed before the 1991 Academy Awards ceremony and said she was completely stoned as she delivered her acceptance speech for winning Best Supporting Actress for her role in Ghost. "Smoking cigarettes and pot every now and then are my habits. And I thought, 'I've got to relax.' So I smoked a joint, my home grown, to get calm before the glamorous Hollywood gathering," she explained in footage obtained by TMZ. She then described her shock when she was announced the winner of the prestigious prize and remembers trying hard to focus to just get to the stage. "When he (presenter actor Denzel Washington) said my name and I popped up, I thought, 'Oh f*ck'...okay, up the stairs ... around to the podium … there's millions of people, get the statue, pick up the statue." Goldberg's admission came out during a voice-over recording session for the 1992 film The Pagemaster. The celebrity website just obtained the footage and released it today. Though Goldberg appears calm and composed in footage of her Oscars speech, her mom was on to her and called her out on being stoned. "My mother called me and she said, 'You smoked didn't you?'" the current co-host of The View said. "I know you're not supposed to admit that you smoked pot … but just because I do it doesn't mean you should," she added.